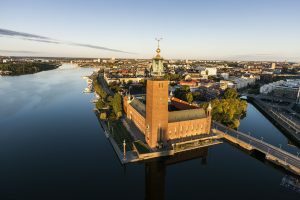 The IEEE EDOC 2018 conference reception will take place on Tuesday October 16 at the Stockholm City Hall and is hosted by the City of Stockholm. The Stockholm City Hall is one of Sweden’s most famous buildings, and one of the capital’s most visited tourist attractions. It is famous for its grand ceremonial halls and unique pieces of art and is the venue of the Nobel Prize banquet held on 10th of December each year. The reception is not included in the registration cost as it is offered by the City of Stockholm. At the time of of registration, please specify if you will attend. The reception at the City Hall will not incur any cost if you select to attend. Please note a no-show would result in being charged for the reception (as the City would do so).